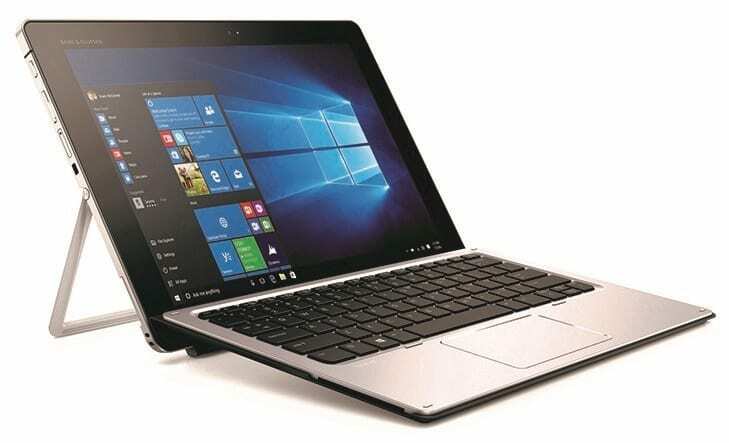 HP Elite x2 1012 G1 Hybrid is a tablet-laptop combo that is built to put superb versatility at the fingertips of professional or business users. The second-generation offering in HP’s business-focused Elite x2 hybrid range features a tweaked, robust design, Full HD display, long-lasting battery and power-efficient Intel Core M processor. This hybrid shows off a very sturdy construction that should enable it fit in as a device that you can regularly hit the road with. The chassis of the new HP Elite x2 1012 is crafted from CNC-machined, T6000 aluminium to enable it withstands knocks and drops. It is impressively thin at just 8.05 millimetres and weighs manageably at 840 grams. The HP Elite x2 1012 G1 2-in-1 sports a detachable design – you can pair an optional backlit keyboard to use as a notebook or detach same to use as a tablet. HP Elite x2 1012 G1 features an adjustable kickstand reminiscent of the Surface Pro 4, allowing you tilt the screen up to 150 degrees. The HP Elite x2 1012 G1 is configured to deliver power-efficient performance with an Intel Core M (up to M7) processor running under the hood. You can have up to 8 GB of DDR3 RAM on your unit for enhanced responsiveness and enjoyable multitasking. The level of performance to expect is boosted with the use of either M.2 PCIe or M.2 SATA SSD with capacity of up to 512 GB for storage. A 12-inch IPS display is fitted on the hybrid, with this offering Full HD resolution of 1,920 x 1,080 pixels for immersive wide-angle viewing. The touchscreen is protected by tough Corning Gorilla Glass 4 and is supposedly able to automatically adapt to different lighting conditions. HP Elite x2 1012 G1 supports the use of HP Active Pen which comes included in the package. With Intel Core M processor known for pinching on power, it is not entirely surprising that the HP Elite x2 1012 G1 is expected to offer about 10 hours of runtime. HP Elite x2 1012 G1 comes with front and rear cameras. There are premium Bang & Olufsen-tuned speakers onboard as well as dual-array microphones with HP noise-cancelling software. The 2-in-1 offers a variety of features including HP SureStart and an optional fingerprint scanner making it ideal for business users. HP x2 1012 G1 offers optional 4G LTE connectivity. HP Elite X2 1012 G1 is not yet available in Nigeria. When available, you can buy it at leading online stores in the country. HP Elite X2 1012 G1 Price in Nigeria is expected to range from N220,000 to N350,000 depending on your location in Nigeria.